Over the years, GM has repeatedly displayed a disturbing tendency to release “almost great” products (e.g. great cars with ‘meh’ interiors, great engines but cheap suspensions). Or they save the quality stuff for late in a cars lifecycle, which gets canceled before the car that realized the models potential is released. Think Pontiac Fiero, for example. It’s maddening to watch. Too many managers, poor up front budgeting, in-house power struggles and bad marketing decisions have repeated this sad song over and over. When GM was “Bailed out” recently, there were many internal changes. Legacy costs went away, management deadwood was sliced off, and seeds for a rebirth were planted. 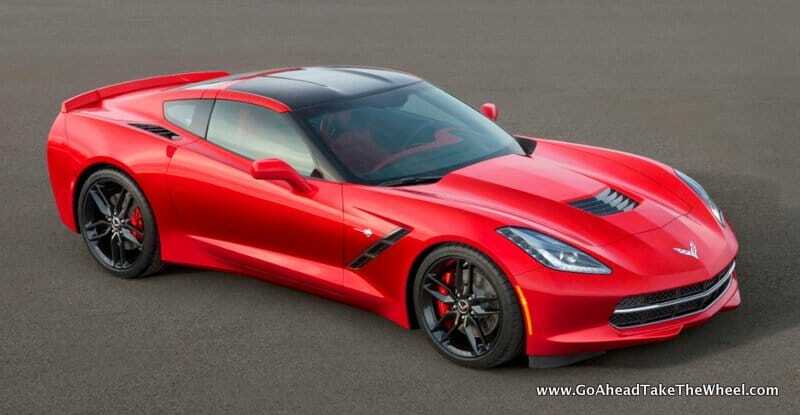 After seeing the new Corvette (7th generation, or “C7”) up close in person and spending nearly unlimited time one-on-one with the chief engineer, and the directors of the interior and exterior studios responsible for the design, it appears those seeds are bearing fruit. We could have come to that conclusion based solely on the passion and enthusiasm exhibited by the people that created the car. Keep in mind these are the same folk that worked into the nights last week preparing for the cars’ big introduction at the North American Auto Show in Detroit on Sunday January 14th at 7PM, and then, after two days on the show floor, flew to the Big Apple to give the New York introduction this past Wednesday. If they were dragging it sure didn’t show, and each one nearly dislocated their shoulder patting the backs of their teammates for their work and cooperation. You see that in the big speeches all the time, but not so often in the more private vehicle specific conversations. 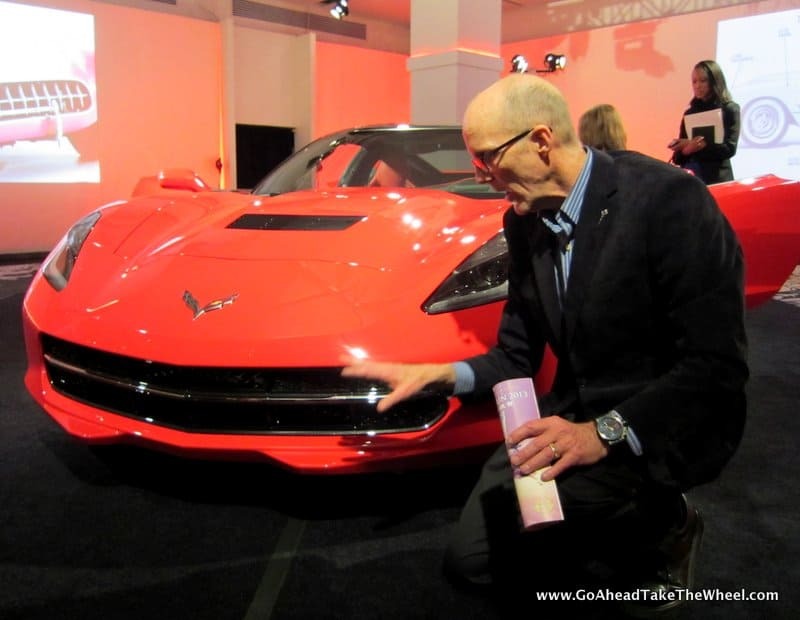 GM didn’t mess around either, trucking one of only two actual C7 cars to NY, along with six high water mark models from the Corvettes history, so the NY media could experience it firsthand. Thanks to the truck driver for rolling all night! In person, the car makes a much better impression than in pictures, making the C6 sitting just behind it look positively dowdy. The proportions and forms project much greater dynamism and depth in 3D. Notably the hood (rendered in ultra-light carbon fiber) is much more curvaceous, especially when viewed as you enter the car. The hood is low, really low, thanks to GMs stubborn insistence on using the venerable “small block”. You would be forgiven for missing the hood forms the first time you enter the car, for the interior, a long running sore spot among critics, grabs your immediate attention. Gone are the yards of cheap looking plastic, the flimsy and unsupportive seats, and the general feeling of “this is where they saved the money”. Instead, nearly every surface you see or touch is artfully sculpted and wrapped in much nicer materials than ever before. 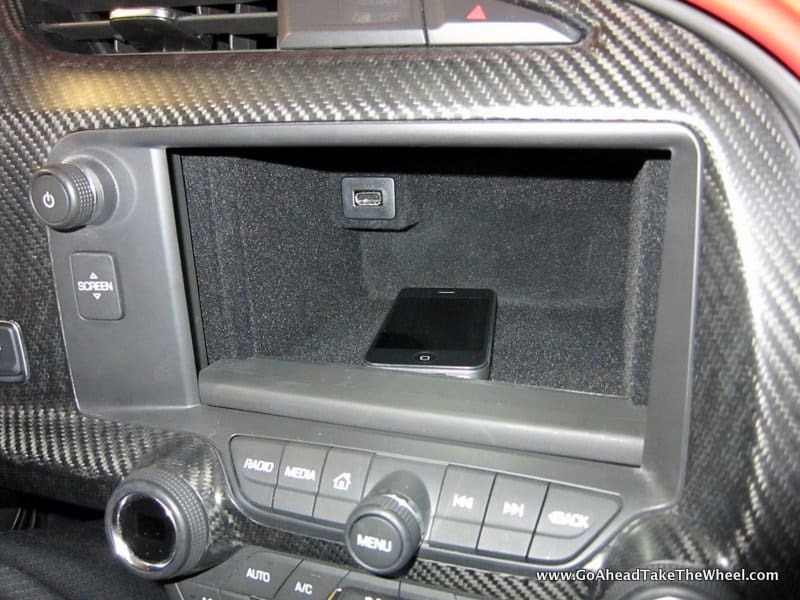 Leather, micro suede (essentially Alcantera), aluminum or actual carbon fiber greets the eye and hand. 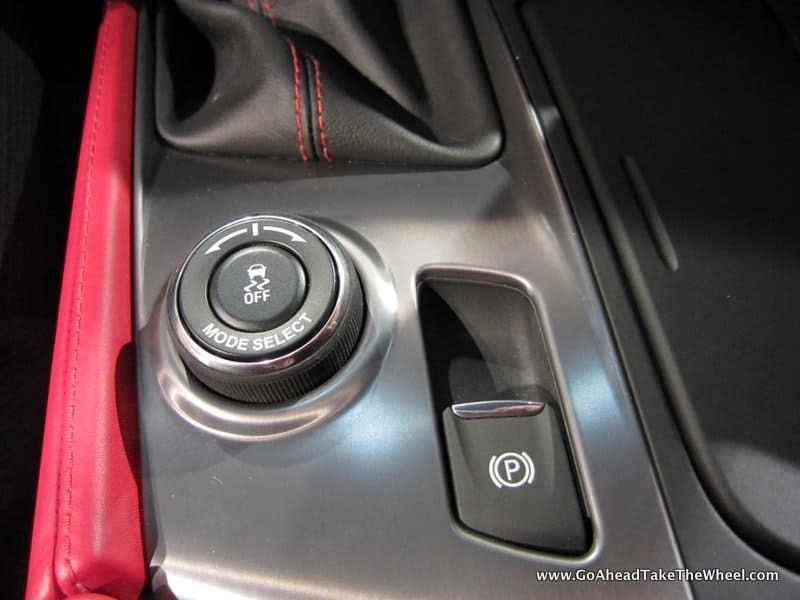 And the switchgear and displays hint at capabilities and equipment under the skin that break new ground for the Corvette. Let’s take a look at the specifics. for the camshaft location, but this new small block places the direct injection fuel pump under the intake manifold as well. 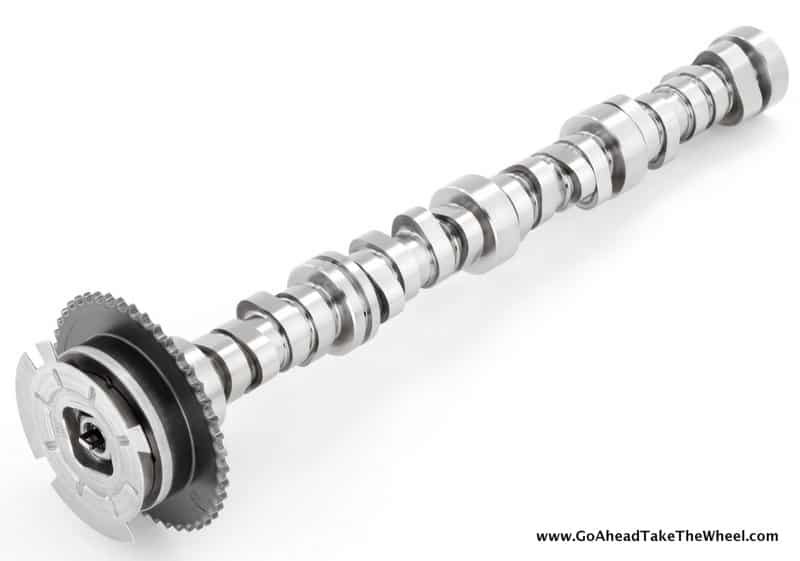 It drives mechanically off a tri lobe on the cam, and pressurizes the fuel to 3,000 psi. I was surprised that they chose to drive the pump mechanically, as opposed to electrically. Tadge explained that they did the math, and all things considered, it was the most efficient solution. The oiling system was upgraded as well, with a variable volume oil pump that switches certain oiling parameters based on driving conditions. In cold conditions, squirters under the pistons soak the cylinders in oil. They shut down though in normal driving, but then are opened again at higher rev and throttle positions. And the cooling system has seen a major modification. A third of the radiators exhaust is now vented through the hood. The radiator is now leaning over towards the front of the car, affording a lower hood line, aiding a lower center of gravity, and affording the new venting. Tadge allowed that this was a change born from the racetrack, as were many other mechanical changes. We all remember some disappointing “tape jobs” that GM has tried to pass off as high performance cars in the past. One reading of the list of equipment included in the Z51 option package is enough to convince anyone that GM has a legitimate real deal car here. Of course there are the usual suspects like larger wheels (20” rears and 19” fronts), revised shocks (Bilsteins, GMs new 3rd gen Magnetic Ride Control dampers are available as an option), slotted rotors, an aero package, and a limited slip differential. That’s all rather ho hum, and expected in a car like this. But there’s more, a lot more: integral brake, transmission and differential cooling, electric control of the limited slip diff, and straight out of the ALMS racer, a 10.5 quart dry sump system. (See sidebar for details) Vents on the top of the quarter panels aren’t just lookers: they feed the transmission and diff coolers, venting in low pressure areas on the rear fascia. Small fans aid the flow when the car isn’t moving. Electronics control hydraulics within the diff to alter the mechanical clutch lock up patterns, a huge step forward in stable control of wheel slip and handling. Racers know how important this in determining a cars handling, and how a system that auto adjusts removes inherent compromises. But the dry sump system is the big kahuna here. GM considers the aluminum oil sump on the standard engine a structural member, but throws it out for a revised version for the dry sump version. They then add a gerotor two stage pump to scavenge the sump, lines to route the oil to the filter, the cooler, and then to the tank, where it slings around the circumference and through a baffle system to separate suspended air and gasses, and finally it is pressurized and fed into the block and heads oil galleries. So confident is GM in the systems ruggedness, the 100,000 mile warranty covers track use! (Take that Nissan, for equipping your cars with a launch control system…that voids the warranty!) Of course, they don’t want you chipping the ECU, or bolting on a set of Hoosiers. The warranty is only valid for the car as delivered. But good luck finding race tires to replace the stock Z51 20” versions anyway. GM put Michelin (another connection from the racing department) through the paces, as these aren’t off the shelf solutions. 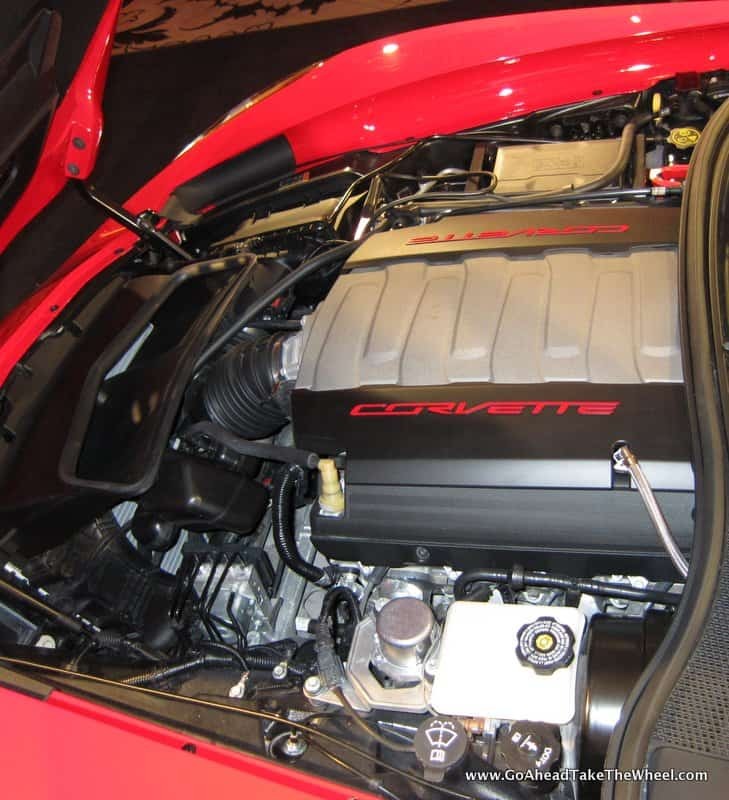 Engineers from both companies worked closely together developing the new shoes, and the Z51 gets not only larger sized rubber, but construction and compound changes tuned to the package. seven (yup, seven) speed manual. That’s the tip of the iceberg though, when it comes to the suite of electronic controls. Central is the Driver Mode Selector. Think Ferrari Manettino, and you’ll grasp its effects and parameters right away. GM mounts the switching dial on the console, and like Ferrari, a major function is the E diff. We breathed a collective sigh of relief knowing that the heart of the system was a real mechanical diff, and are thrilled to know that the clutch actuation goes from full open to fully locked. Other parameters that are changed in the various settings include the throttle input curve, the steering effort, the exhaust “cutouts”, the launch control, traction control via engine torque, Stabilitrak stability control (defeatable), and the gauge cluster configuration. functions. It’s touch sensitive, reacting to swipes in the same manner as an iPad, and I must say, both screens are nicely integrated largely avoiding the square peg in a round hole look common to some earlier designs. The infotainment screen has one more trick up its sleeve: it can disappear, sliding down into the dash like a power window, exposing a compartment to stash your wallet and phone. 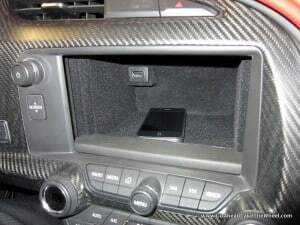 Plug that phone in there as well and enjoy your library of music via the infotainment systems integration. Actually, the entire interior is a work of art compared to recent Corvette efforts. Surfaces are all delights to the eye, be it leather, carbon fiber, aluminum or microsuede. Director of interior design Helen Emsley insisted right from the start that her designers use real materials, in appropriate quantity, and that no “looks like” materials be used. If it looks like aluminum, it IS aluminum. Notably, she’s from Britain, and comes to America via Opel in Germany, which underscores GMs desire to take the Corvette in a new direction. Real Napa leather is used on the seating surfaces and it took mere seconds to decide that these seats will blow away the abominations we tolerated in the C6. In fact, they are magnesium framed, and for the first time a Competition seat is available. Further proof GM is serious is that these seats have adjustable side bolsters AND two harness openings for the installation of 3” shoulder belts. From the back, you’ll swear they were lifted out of the Porsche GT3RS, so similar is the appearance with their glossy back panels. Unlike the Porsche competition seat, this one is electrically adjustable, and thus fits more drivers. I was able to dial in the seat rake, seat height, legroom, steering wheel height, back rake and bolster support in seconds, and there is ample leg and headroom to spare for those who are bigger than my 6’3 frame. Helen related some of the struggles they faced in trying to get the design that was drawn into the actual car. Wrap around dashes that flow into the door are high stakes games for manufacturers. All doors are adjusted in their opening on the assembly line for perfect joining gaps, and if the interior panel, which is usually fixed to the door doesn’t match the dash by as little as 1/16th of an inch, drivers will notice it in an instant. Helen did something that is unheard of at GM. She invited the manufacturing engineers up to the studio and asked them for a solution. The big bosses reluctantly went along, expressing security fears and someone leaking the forthcoming C7 design. Helen said, “Who can we trust if we can’t trust ourselves?” It paid off, and the assembly line worker now has a method of tweaking each door panel on the line to ensure perfect fit. I hope that this is another bellwether of how GM is going to operate in its new form. Such interdepartmental cooperation was unheard of in the ‘old’ GM. steering wheel, which is actually aluminum. But due to glare issues, it’s anodized a dark grey, which is a shame because it just doesn’t ‘read’ as aluminum. I wondered out loud if a milled section or edge to reveal the core aluminum might help. Turns out I hit a moving target, and Helen suggested I hold off final judgment as the preproduction car we were in wasn’t finalized in that particular area. 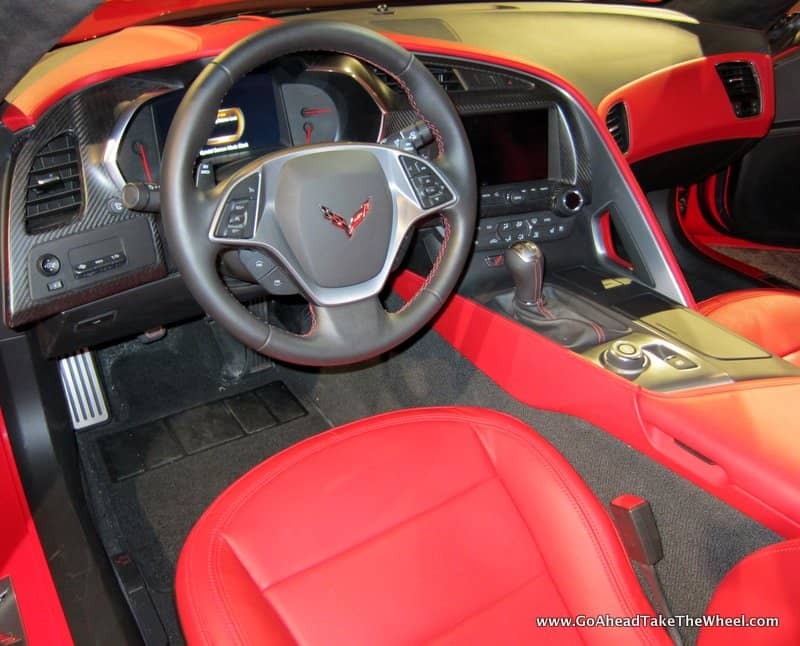 But overall, it’s hard to argue that the new interior isn’t light-years ahead of previous Corvettes dating back decades, in terms of quality and design, and will finally compare well with the competition. The exterior though, took me a little longer to warm to. Chief designer Tom Peters got right into the nitty gritty, and we discussed nearly every inch of the car. Early critics have raised objections about the taillights in particular, but I think it’s something you have to see in person. They’re actually rather interesting when lit, and much more three dimensional than they appear on paper. Tom pointed out that the old round ones would have been out of place on this car and I certainly agree. Working with the racing and engineering departments resulted in the need for cooling duct exhaust vents in the rear fascia. When attempting to use the round lights at one design stage, it looked rather Swiss cheese-like with a bunch of ‘polka dots’. The vents were integrated with the taillight forms, and are fully functional, in specific low pressure locations. Closer examination will reveal that the final forms really aren’t “just a copy of the Camaro” but are rather different shapes. Indeed, they are similar in count and proportion, but Tom reminded us that the two cars have shared the basic light count for decades. And while I’m sure that Tom is not kidding when he says that the spoiler (rather small on the Z51, and nearly non-existent on the base model) is all that’s needed to balance the car, (after all, the car spent thousands of hours in the wind tunnel) I find it to be the single part of the car that I don’t find well integrated. While it fits “on” the complex trailing edge surfaces, it appears that it wasn’t designed in consideration of those surfaces. 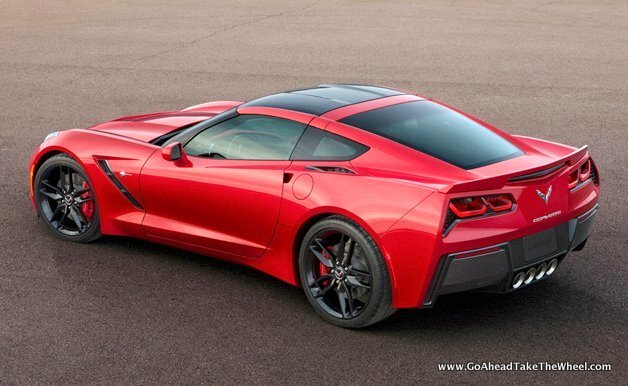 I am a fan, however, of the new quarter panel treatment and the revised B-pillar appearance. It’s a pretty major shift, and usually I’m against changing such core issues on a model changeover, but it really cleans up the design. I was originally dubious about the hood as well, finding it rather busy. In photos, the form just doesn’t render as it does in person. There is far more sculpting revealed to the eye, and the extractor, which looks tacked on in the photos is actually a beautifully painted piece. I counted 11 character or valley lines on the hood in press photos, and thought, “too many! !” Now I still think it’s too many, but in smaller case without exclamation points. I wouldn’t mind losing two bone lines near the valley, but it’s picking nits to be honest. 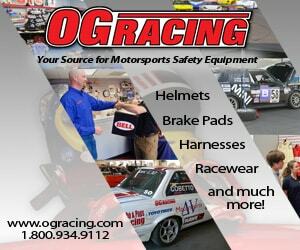 Tom related the racing departments involvement, which he said was a major driver in certain areas. The quarter panel top vent inlet locations, for instance, where requested by the Pratt and Miller boys, and their placement yields not only superior aerodynamics, but a lighter car was well, since locating the coolers at the back of the car removes yards of piping and improves weight distribution and reliability to boot. This was a reunion of sorts for our staff design guy, as Jake and Tom Peters both worked at the same design shop (Powers Design International in Newport Beach) while attending the same design school (The Art Center College of Design in Pasadena), albeit in different eras. They both shared essentially the same east coast to California drive complete with one vehicle breakdown! Of course, Tom seems to have done something with his education! 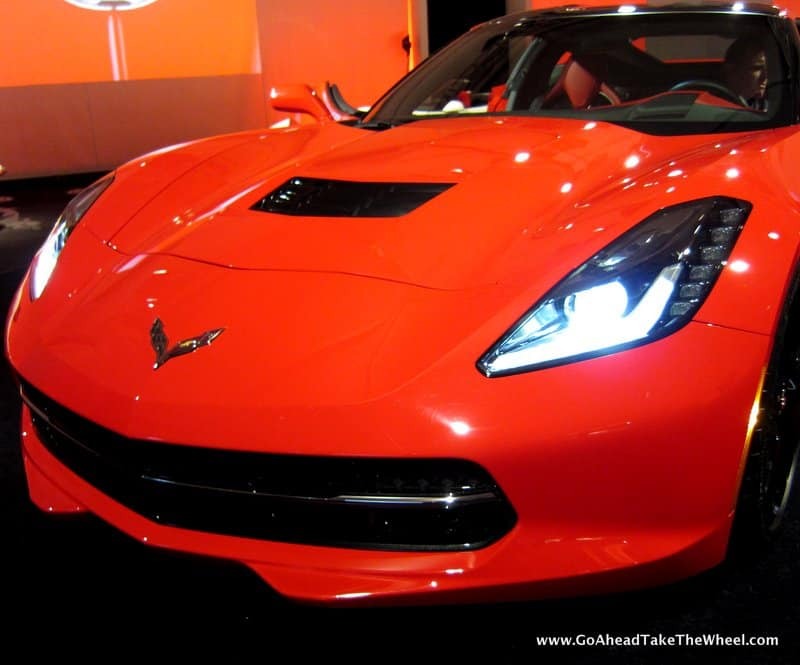 Overall, there is no mistaking the form as a Corvette. The Coke bottle shape is still hinted at. The cabin-to-hood proportions are essentially carried over. The “Mako shark” grills are where they always are, albeit canted a few degrees more and larger in scale to evacuate more air from the engine compartment. 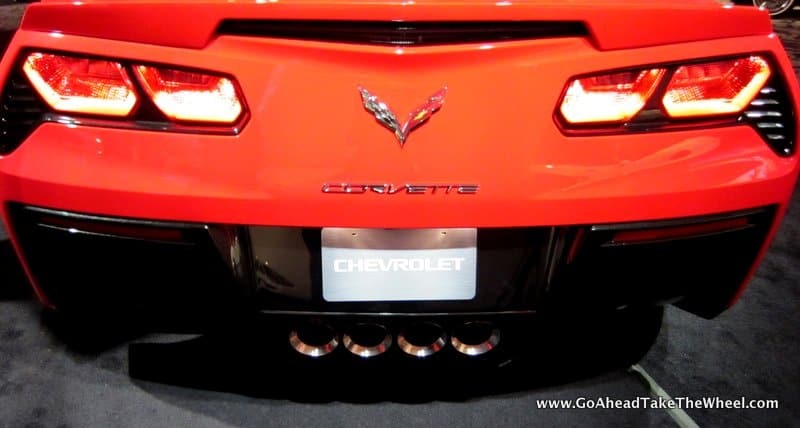 There are still four big exhaust tips in the center of the rear fascia. The fender peaks are still peaking, but look closely; the tops are actually a plane that’s nearly horizontal, sloping down over the headlights. That’s not happenstance or merely to please a designer’s eye, it’s the result of windtunnel work. According to Tom, there is no square inch left untouched by the tunnel. He pointed out a section of the grill area roughly 3.5” x 2.5” that was blocked off. “That’s huge, aerodynamically“, he said, then went on to show us the angle of the grill pieces and the actual radii were tunnel tweaked as well. I questioned the “fangs” on the lower grill lip. He could see I wasn’t a fan. Turns out they are part of the pedestrian safety package, and of course, have been tunnel tweaked to double as downforce devices. The muttering we heard throughout the room was people saying that this was a Corvette that they would actually consider. While there are certainly some details that are less successful, the overall whole is a huge leap forward, and the car seems to have a cohesive nature that speaks to the integrity of the design process. And that’s probably the first time in my memory I’ve thought that about any GM product. 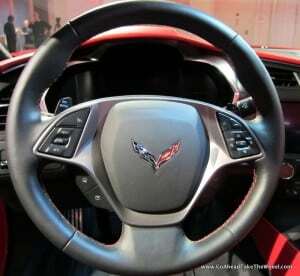 We will be anxiously waiting some time behind the wheel of a Z51, please! Receive Email Alerts for New Articles. Just Type Your Email Address then Click Submit.